As each year passes, we become increasingly aware of our impact on the environment caused by construction. Advances in chemistry and on-site methodology continue to shape the future of the products that we install. Simply put, it is our responsibility to preserve and protect our environment for future generations to come. 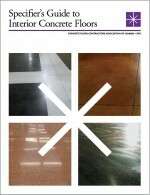 Exposed concrete floor finishes are becoming a large part of the sustainable future. The combination of colours and textures for concrete surfaces provides an almost limitless expression of creativity for architects and long term durability for owners. Please review our presentation on architectural finishes for further information. If you have any concerns or other suggestions, please feel free to send us an e-mail.